ShoukeiÂ´s page. She is a comic artist. Also my sister. 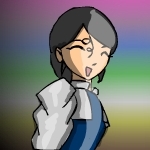 Shoukei (Jess the Dragoon) is my sister who is also doing flash games and animations. She is also an administrator of Tamugaia.com. Believe it or not, her design and graphical skills are of a high level.